Since 1968 Bergerson Construction has been serving a variety of clients throughout the Northwest, in both Oregon and Washington. Our marine projects include piledriving, seawalls, bulkheads, cofferdams, fender systems, bridge and pier structures, floating structures, dredging, shoreline protection, marine outfalls and intakes, waterfront remediation and demolition. Land based projects include but are not limited to pile driving, deep foundations, bridge construction and shoring. Our fleet of cranes, barges and other construction equipment allow us to serve on both marine and land-based projects. We also maintain a fleet of sectional barges for a nimble approach to a variety marine sites including lakes and non-navigable bodies of water. Safety, Integrity and Quality have always been the cornerstones of each of our projects. Our management team works closely with our clients to ensure these are integrated into every project while maintaining economy and schedule. The end result is a satisfied client and a quality product. Call us today and let us bring our assets and expertise to your project team! 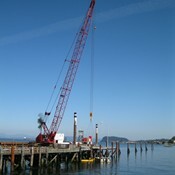 Construction of a new steel and concrete pier to replace and aging timber pier.